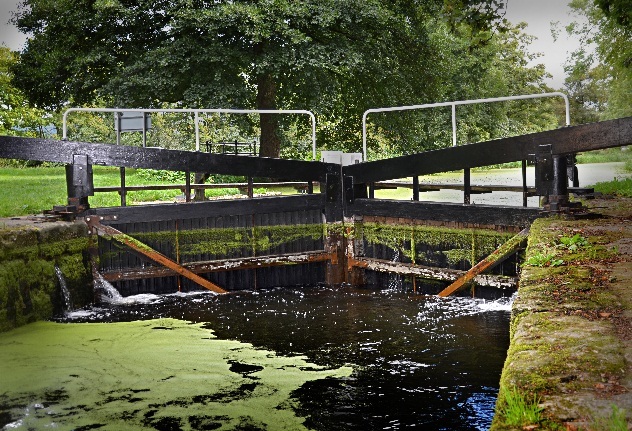 The aim of the project was to provide a sustainable and cost-effective alternative to traditional timber wood lumber fittings for the Cotswolds canal gates (also known as the Blunder Lock). Plaswood is manufactured in the UK, from 100% UK recycled plastic products, and it is both robust and flexible , as it can be formed into different sizes and easily adapted using standard tools in conjunction with other materials, making it stand out in the landscaping and furniture markets.Plaswood high performance lumber is made from 100 per cent recycled plastic and offered a no maintenance solution: unlike conventional wooden decking or lumber (aka timber), Plaswood doesn’t require annual maintenance, staining or painting. It is therefore a sustainable and cost-effective alternative to using traditional materials such as hardwood, concrete and steel. The previous timber planks used in the gate required extensive maintenance and deteriorated quickly. The Blunder Lock near Stroud were restored in 2013 Plaswood recycled plastic lumber sections were fitted to the gates at the lock. As a result, water leakage is now virtually non-existent, and significantly less than that through the timber planks on the other gate of the pair, which were installed at the same time. A recent inspection in 2017 revealed that the top gate fitted with Plaswood ‘plastic wood’ lumber sections, is outperforming timber planks at the canal lock gate in the Cotswolds, with excellent implications for future work on the Stroudwater Navigation. Plaswood has a longer life expectancy than timber, and, unlike timber, it doesn’t degrade with age, which means that will be great value for money over a long period of time.